I am all against misogyny, sexism, violence against women but in your quest to underscore these points in a movie aren’t you becoming too subjective and not objective in your review? Currently, these things do happen in a society, definitely wrong ,but don’t you think the filmmaker should have the freedom to portray a character who does those bad things? For example in the movie “Zero Dark Thirty” ,the film maker was criticized for depicting the extreme duress applied to interrogate detainees. Now these things did happen in the real World & if the filmmaker feels it is important to depict such a scenario why judge him? Surely, it doesn’t mean that the film maker supports interrogation techniques applied like water boarding which are considered cruel & inhumane. Now if you stop including characters in your script based upon their actions which would deem bad in a real life society then all movies would be one-dimensional. 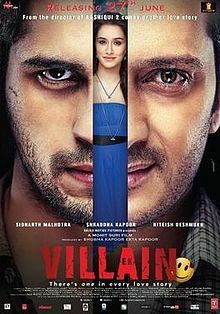 A film like Grand Masti where almost every scene is at expense of women, I understand & support your concern but in this movie Ek Villain just because Rakesh kills woman for the reasons specified in your review doesn’t mean the filmmaker accepts violence against women. This is my perspective which may be right or wrong. I am not saying your reasoning is wrong altogether but my rather bigger question is where do you draw the line? Thanks for the thoughtful post, Nicky. I agree that filmmakers need to be able to include characters who exhibit aberrant behaviors in their films. As much as I love unapologetically happy films like Queen, not everything needs to be flowers and unicorns. But I think there’s a fine distinction to be made about the way Ek Villain treats violence against women, and it’s an important one. As I mentioned in the review, the killer in I Saw the Devil murders women at random. There’s nothing the women do to provoke their murders, and that adds a sense of urgency to stop the killer. Rakesh attacks women for very specific reasons: he kills nags. His wife’s nagging behavior drives him to it, and Brijesh backs him up that this nagging is a problem. Every single woman in the movie — except for Dr. Padma but including Aisha — is a nagging shrew who makes Rakesh feel bad. If only these controlling women would just shut the hell up, life would be so much easier for middle class guys like Rakesh. There isn’t any moral counterpoint to Rakesh’s murderous inferiority complex. Heck, I was longing for Guru to give a speech about how Rakesh doesn’t really know what love is. If the alternative is men killing women at random, it makes Brijesh slapping his wife seem almost benign. The thing that most validates my concerns is that Rakesh is ultimately rewarded by getting the thing he most wanted: a confession of love from his wife. Had he not killed all these other women and gotten himself in trouble with the police, she never would’ve felt that she needed him. I was also troubled by fan reactions on Twitter praising Riteish Deshmukh as the real hero of the movie. I’m hoping that they were just praising his performance (which was very good), but maybe not. Thanks Kathy for taking my comment in a positive spirit & elucidating your thoughts on the same in a comprehensive manner &! I can now see where your concern stems from ! Didn’t even know there was a Hindi remake of Oldboy, thanks for the info. May have to check that out since I just recently saw the Spike Lee version (which, in all fairness, is not terrible – I can imagine liking it as much as the original if I had seen it first). But I’m going to have to skip Ek Villain for the simple reason that Mohit Suri made Aashiqui 2, arguably the worst Hindi movie of the last few years and certainly the most overrated. I really don’t need to see anything Mohit Suri has up his sleeves, even if this movie has Deshmukh and Malhotra, both of whom I like. I just saw this movie and I loved it because of the flashbacks. I love the two leads.